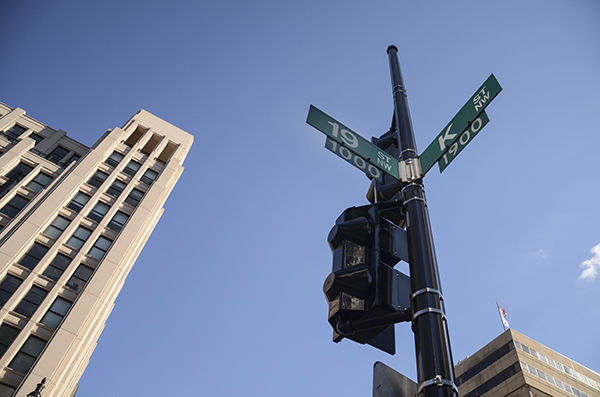 A woman threatened to harm herself and others in an office building on 19th and K streets a little after midnight on Monday. She was later arrested for assaulting a police officer. GW sent a security alert to the community early Monday morning warning of an active shooter near campus, an hour after the Metropolitan Police Department stated there was not an active shooter. GW sent an alert to students at 3 a.m. on Monday morning warning of an active shooter near campus nearly three hours after MPD officers responded to the scene. A University spokesman said GW officials followed University protocol when sending out the alerts and relied on information from MPD because University Police Department officers did not respond to the situation. Corinne Hughes, the MPD lieutenant who covers the police district that includes Foggy Bottom, said at a neighborhood meeting on Wednesday night that MPD wasn’t treating the event as an active shooter situation, but GW could have thought it was an active shooter because there were shots fired at the officer. “It could have turned into an active shooter,” she said. MPD learned that a woman, Sophia Dalke, threatened to harm herself and others in an office building on 19th and K streets a little after midnight on Monday, according to an MPD release. Shortly before members from the department responded, the woman shot a gun and then barricaded herself in the building, according to the statement. Dalke, 31, who is a resident of Springfield, Va., was arrested for assault on a police officer in what police called a “peaceful” conclusion following the barricade incident. She surrendered to police at about 10:30 a.m. on Monday, according to the MPD statement. Both MPD spokeswoman Aquita Brown and University spokesman Kurtis Hiatt declined to say when MPD notified the University of the situation or what information MPD told officials at GW. Hiatt said in an email that GW defines an active shooter using a Department of Homeland Security definition. The department calls an active shooter an “individual actively engaged in killing or attempting to kill people in a confined and populated area, typically through the use of firearms,” according to its website. He said GW sends campus alerts when the University becomes aware of an ongoing threat that could affect the GW community. “During these situations, information changes quickly and the University provides updates with the most accurate information it has until the incident is resolved,” Hiatt said. Senior Associate Vice President for Safety and Security Darrell Darnell, whose office oversees GW’s emergency alert system, has said in the past that since he arrived at GW in 2010, officials have decreased the number of emergency alerts sent because students tune them out if the messages are sent too frequently. Earlier this year, GW alerted students to a robbery an hour after MPD sent out an alert for the same incident. Two years ago, GW officials said they mishandled two gun threats on campus. MPD waited hours to inform UPD about an armed robbery on campus, and in the same semester, GW waited 15 minutes to tell city police of a gun threat in South Hall. Michael Levine, who has more than 40 years of experience as an officer and a police consultant, said that warning the community is the “last concern” for police dealing with potential active shooter situations, since their first priority should be keeping the people in the immediate vicinity safe. This article appeared in the November 19, 2015 issue of the Hatchet.